With a slim profile that never sacrifices performance for looks, the Marantz NR1509 AVR delivers 5.2 channels and high-resolution surround sound from Dolby TrueHD and DTS-HD Master Audio. With 6 HDMI inputs — including one on the front panel — the NR1509 is fully compatible with the latest 4K Ultra HD video specifications, including 60 Hz full rate content, 4:4:4 Pure Color sub-sampling, BT.2020, HDR and Dolby Vision. The NR1509 features a power amplifier section with high-current discrete transistors to support high-resolution audio. Enjoy your favorite music services via Bluetooth, Apple AirPlay or the HEOS app. Control NR1509 with your voice and Amazon Alexa — download the HEOS Home Entertainment skill and ask Alexa to play, pause or stop music, switch inputs for your different media players, turn up the volume and more. Featuring a high-current discrete power amplifier section, you get exceptional sound for movies and music with identical power on all five channels (50W per channel: 8-ohm, 20Hz – 20kHz, 0.08% THD) with low-impedance drive capability for superb speaker control. Supports surround formats like Dolby TrueHD and DTS-HD Master Audio for an immersive home theater experience. Slim profile is half the height of a traditional AVR, while delivering the dynamic sound quality that defines Marantz excellence. Includes six HDMI inputs — with one HDMI input on the front panel for quick connection — each one supporting HDCP 2.2, 4K Ultra HD 60Hz video, 4:4:4 Pure Color sub-sampling, Dolby Vision, HLG, High Dynamic Range (HDR) and 21:9 video, 3D and BT.2020 pass-through. Dual antenna system lets you stream the most popular music services via Bluetooth, AirPlay or the HEOS app. Listen to your playlists on Spotify, Pandora, TuneIn, Deezer and more. Built-in HEOS technology lets you enjoy your favorite music in any room of your home for a wireless, whole-home audio experience. Play the same song in every room, or select a different song for each connected room — the choice is yours. Enjoy music from Spotify, TuneIn, Sound Cloud, Tidal, Napster, Deezer or your local music file libraries. With additional HEOS components, like HEOS-capable speakers, play all your music in one room or many. Enjoy effortless voice control and total flexibility from the leading voice agents. Speak commands with Amazon Alexa , Google Assistant, Apple Siri and high-end smart home automation, Josh.ai. Ask to play your favorite music, turn the volume up, skip to the next track, switch inputs and more. Switch between voice agents, or pick a favorite to use — the choice is yours. Functionality varies by voice agent. Use your voice to stream your favorite music services to this HEOS-enabled device. Ask Alexa to play music from Pandora, Spotify, Amazon Music and much more. Switch between inputs (Blu-ray, DVD, Media Player, etc. ), turn volume up or down, pause, mute and play the next song — all with your voice. With HEOS Home Entertainment and Alexa, you can stream to this product and any other HEOS-enabled device. Ask your Google Home, Google app or other devices with Google Assistant built-in to control content across your listening environment. Start music in the HEOS app, then ask your Google Assistant to control volume, play, pause, skip tracks and more. ‘Works with the Google Assistant’ feature is always improving — further enhancements arrive in 2019. An elevated voice agent for the high-end smart home, Josh.ai offers flexible voice control for nearly any aspect of your day-to-day experience and entertainment environment. Use voice commands to control the thermostat, lights, home appliances, speakers, AVR and more. Josh.ai is installed by custom integrators and accessed through an app on your phone or tablet. Works with iOS and Android devices. Ability to decode high-resolution audio ALAC, FLAC and WAV lossless files up to 24-bit/192-kHz, as well as DSD 2.8MHz and 5.6MHz tracks (the audiophile format of SACD) lets you enjoy music exactly as the artist intended. Listen to your music via the front panel USB port or over network sources. Easily connect your analog turntable to the receiver and enjoy the pure intent of each recording within your vinyl collection. Optimize your audio experience with Audyssey MultEQ, Dynamic Volume and Dynamic EQ for a seamless setup of your listening environment. With the supplied measurement microphone, MultEQ analyzes each speaker's output (including the subwoofer) and generates precision digital filters that optimize each channel for the correct frequency and time domain response. Use Audyssey Dynamic EQ to deliver clear dialogue and wide-band response even at reduced volume levels, or Audyssey Dynamic Volume to avoid shocks and normalize volume when content switches between commercials, announcements and TV programs. 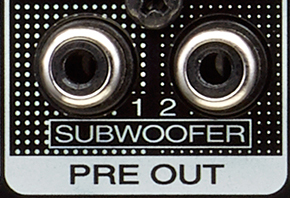 Supports dual subwoofers for even, low-frequency bass response within your listening environment. Enjoy accurate bass with no audible peaks or dips no matter where you place your subwoofer. Easily control the receiver with your Smart TV remote via the HDMI CEC functionality associated with your Smart TV. Simply set “HDMI Control” to ON in your receiver, then set “Smart Menu” to ON and begin controlling the NR1509 with your TV remote. 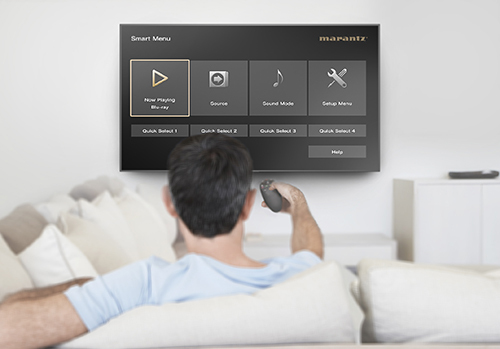 The Smart Menu home screen gives you quick access to source and surround mode selections, the AVR's setup menu and four Smart Selects. 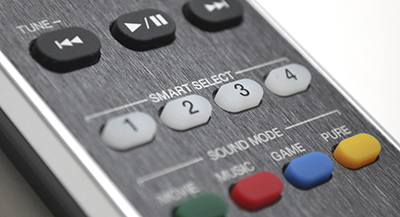 Four Smart Select function buttons on the included remote control store your preferred setup — including input, volume and Audyssey configuration — for particular sources. With the push of a button, the receiver perfectly configures for any source, from Blu-ray to TV set-top box, to your favorite Internet radio station and more. All Marantz 2018 AV receivers offer extended support for easy custom install integration. Features “ihiji Invision” remote system management technology, “Domotz Pro” remote monitoring and management technology with dedicated web interface to control and set up your AV receiver from a computer on the same network. Let your installer easily monitor the status of connected products and troubleshoot remotely from a separate location or on-the-go. Founded in 1953, Marantz has a long and rich history of designing audio components embraced by music lovers and critical listeners around the world. Because Music Matters, the NR1509 carries on our long tradition of delivering a best-in-class listening experience for music and cinema.